How Can I Compare Two Text Files? Whether you need to check source code, find errors, or compare re-written content, comparing two files is a necessity. With run-of-the-mill text editors like Notepad or WordPad, comparing files is a tedious, manual process involving scanning through hundreds of lines of small black text in order to find minimal differences. It's easy to make mistakes when going through a process this laborious. Professional text editors can often automate this process for you. 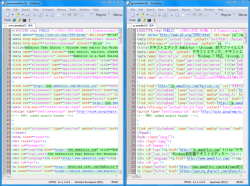 Many third party text editors include a Compare Documents feature that allows you to choose two files, and compare them side-by-side with synchronized scrolling and color-coded, highlighted differences. Additionally, these text editors often include multiple options for fine-tuning your comparison. For example, you can usually choose whether or not to ignore encoding, spaces, case, and many other options. You can cycle through the highlighted changes, eliminating the need for any manual scanning for tiny differences. Third party text editors can turn the long, tedious comparison process into a quick and painless tool, letting you focus on your job while your text editor does the grunt work. If you don't want to completely change text editors, you can opt to go with dedicated file comparison software. Like text editors, these are often available online. Make sure to research your options before choosing any one software. Keep in mind that comparison software doesn't allow you to actually edit the documents within the program. You'll have to switch back to your text editor in order to make changes.